There are so many ways to incorporate learning about money into gift giving. The first place to start is making a budget. For younger kids, you can talk about one gift, but for older children, they can set a budget for the whole holiday. You can extend this activity by setting up a savings plan for next year. If we spent $200 on our cousins this year, how much would we need to save all year to have enough money? How much would each gift cost? Will we be able to afford it and what can we change? If you go under budget, how can you use the money to bless someone else? We are quickly becoming a cashless society. Our children need to know how to use cash. Plan ahead and take money to the store. Have your children buy gifts by counting out the correct change. You can further this activity by asking the children to calculate how much change they will receive. Play store at home and teach children how to count back money as a cashier. You can use fake money if needed. Many youths don’t know the valuable skill of counting back money, and it’s impressive to find a cashier that does know this skill! Time management is critical when shopping. How long will it take a gift to arrive at the destination? If I order a gift online, how long will it take to arrive? What if Amazon is even late? How far ahead do you need to plan? This doesn’t just apply to online shopping. Do you know how long it takes to walk the length of the mall? Can you estimate drive time, finding a parking spot, locating 7 gifts, waiting in line, and driving back home? Will you eat a meal while shopping or grab a cup of coffee? How do those factors affect your budget? 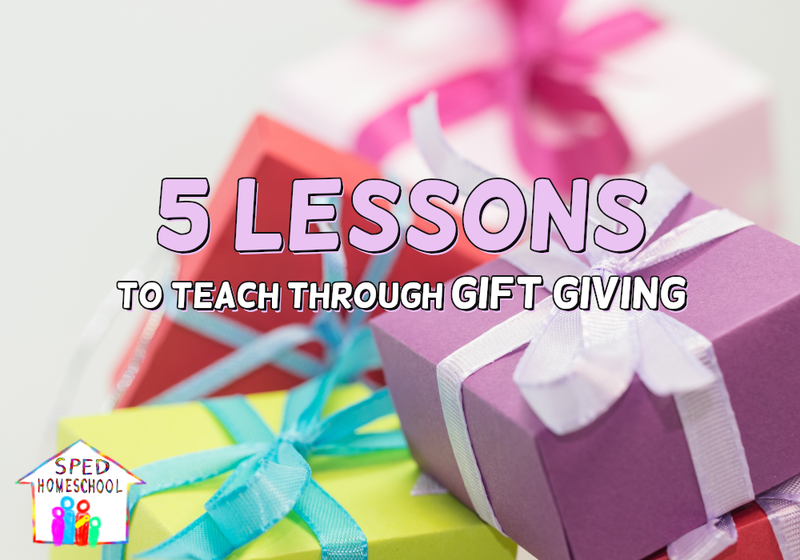 There are a number of time management lessons that we can teach through gift giving. Giving gifts that don’t cost much – handmade gifts – provide many more lessons! New skills, budget for cooking or craft supplies, deciding what a person would like, are just a few things to be learned when creating gifts. Is it really cheaper if you are buying a lot of supplies? How much time will it take to make the items, and will you be able to finish? I recently saw a meme go around Facebook about shopping for yourself while shopping for others. The struggle is real! How many times have you bought a gift for someone else and then one for yourself? Or changed your list? The struggle is real for our kids, too. Sometimes the struggle is that they want the gift for themselves and don’t understand why they can’t’ have it. Other kids struggle with wanting to buy for someone what they want instead of what the other person wants. I know Grandma wants a hat, but can it be pink because pink is my favorite color? Even if Grandma doesn’t ever wear pink? This is the perfect time to teach kids to think outwardly instead of egocentric thinking and behavior. Some kids naturally do think outwardly, but others need specific instructions and loving examples. Let’s not get so busy this holiday season that we miss the opportunities teach through gift giving to others. The most important lessons are lessons of the heart, which means the most important lessons we teach all year could be those we teach during the holidays. Looking for more holiday teaching ideas? 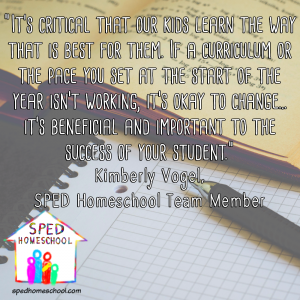 Check out the SPED Homeschool Christmas and New Year Pinterest boards for great hands-on learning activities you can use all season long. The lesson plans are methodically laid out with alternate ideas and I know what needs to get done. I have plans for my kids, students, and therapy. I take my plans seriously because parents are investing time and money in my services. Even with my plans, there are opportunities I miss when plans become more important than reaching the heart of the people I serve. One day, due to a scheduling issue, time was short with a student. I needed to nail our plans and in record time. First on the list: reading a section from the student’s current “for fun” reading book. The main character of the book had to fill out a form with what word best describes her. She listed people in her life and said what word they would give her. After reading the passage, we did that for the student. Most of her comments were “I don’t know,” or “no clue”, but one stood out; the word beautiful. The big moment came when I asked her what word(s) she would give herself. Her words were all negative. I seized the opportunity. I told her I didn’t see her that way and that the things we tell ourselves come across in what words we give ourselves. I told her what word I would give her now and what word I would’ve given her last year. After we discussed those, I asked her what word God would give her. I reminded her that he didn’t see her as stupid, weird, or silly. He loves her so much he sent his son to die for her. That’s pretty special. This opportunity took less than 15 minutes. I pray the positive words are cemented on her heart and the negative ones will lose their power. 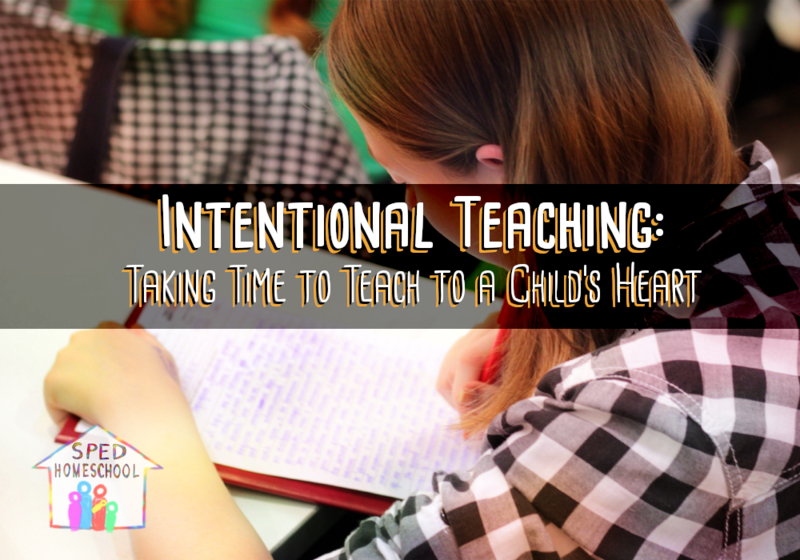 Here are some ways I ensure that I don’t miss intentional teaching opportunities. As a part of my quiet time, I now pray for today’s intentional opportunities and journal about yesterdays. Knowing I will journal about them makes me want to find them – daily. I recently spoke to a man from another country. He told me that we are so busy. He is from a place where a lunch with a friend can last until the evening meal. People talk for long hours. The community is strong. People take priority over plans. So many things on our to-do list can wait, if we decide it’s okay to be flexible. Spending time with a friend isn’t wasted. It’s an investment. Not every conversation is the opportunity of the day. Not every day has an outward opportunity. Yet, every day does have an inward opportunity to pray for people. Pray through each encounter and listen for the voice of God to whisper or prod your heart about giving encouragement, offering prayer, or going deeper. If this is a new concept, it takes some adjustment, but with practice and prayer, you will notice the prodding of the Spirit. Teaching good, moral lessons is important, but lessons for the heart taught in the moment are effective. We need to slow down and allow the Spirit to guide us in these lessons.